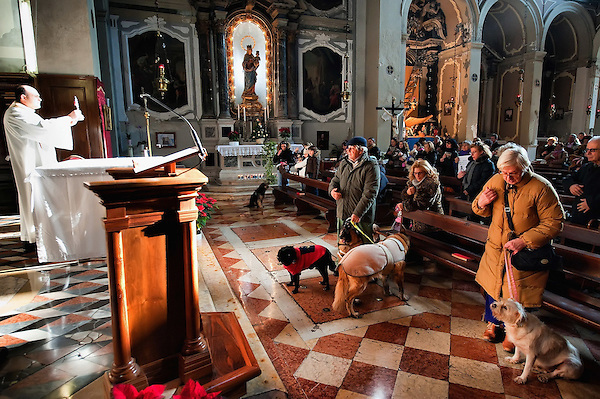 This custom is probably conducted in remembrance of St. Francis of Assisi’s love for all creatures. Francis, whose feast day is October 4th, loved the larks flying about his hilltop town. He and his early brothers, staying in a small hovel, allowed themselves to be displaced by a donkey. Francis wrote a Canticle of the Creatures, an ode to God’s living things. “All praise to you, Oh Lord, for all these brother and sister creatures.” And there was testimony in the cause for St. Clare of Assisi’s canonization that referred to her little cat! It was a really nice and friendly ceremony, I believe next week there will be one at the Bragora if you are around is worth checking. Happy is the one who leads the life of a dog! For the dog has ten characteristics which every believer should possess. First, the dog has no status among creatures; second, the dog is a pauper having no worldly goods; third, the entire earth is his resting place; fourth, the dog goes hungry most of the time; fifth, the dog will not leave his master’s door even after having received a hundred lashes; sixth, he protects his master and his friend, and when someone approaches he will attack the foe and let the friend pass; seventh, he guards his master by night, never sleeping; eight, he performs most of his duties silently; ninth, he is content with whatever his master gives him; and tenth, when he dies, he leaves no inheritance. Not to mention Bulleh Shah, the famous sufi from Punjab was quite innovative in his scathing about them and here, compares and un-enlightened “Mullah” with a dog!